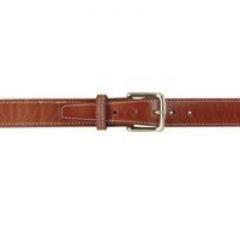 Improved reinforcement makes this leather belt a MUST for concealed weapon carry. Won't sag with a holster and weapon. Provides a firm platform for a smooth draw. Gives all-day comfort. 1-1/2 in. wide. Warehouse pulled order wrong and I got the wrong belt. But they made a quick recovery and the correct item will be here before the end of the week Thanks Cops Plus.